Here is the 24 hr precipitation ending 8 AM Friday for sites with more than .5 inch. Some locations on the western slopes of the Cascades and Olympics have already gotten two inches. 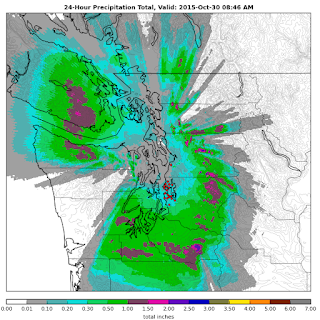 The precipitation over the same period from Seattle RainWatch (based on calibrated radar data) shows a profound rainshadow NE of the Olympics, but 1.5-2 inches along the western Cascade slopes. It is now clear that we are going to have one of the wettest periods in a while starting today, with less rain in the lowlands and much more in the mountains. Let me show you a sequence of 24h precipitation totals from the UW WRF modeling system. For the period through 5 PM Friday there is 1-3 inches in the mountains. Note that Puget Sound region is drier--the is due rainshadowing to the east of the Olympics Mountains, something expected from the westerly flow regime we will be in. For Sunday, there is still plenty of moisture, but the focus moves southward. Adding up the entire period is impressive and scary (see below), with 5-10 inches over much of the WA Cascades and mountains of southwest WA, with some peaks getting even more. This will be enough water to push some westside rivers, and particularly those near and south of Mt. 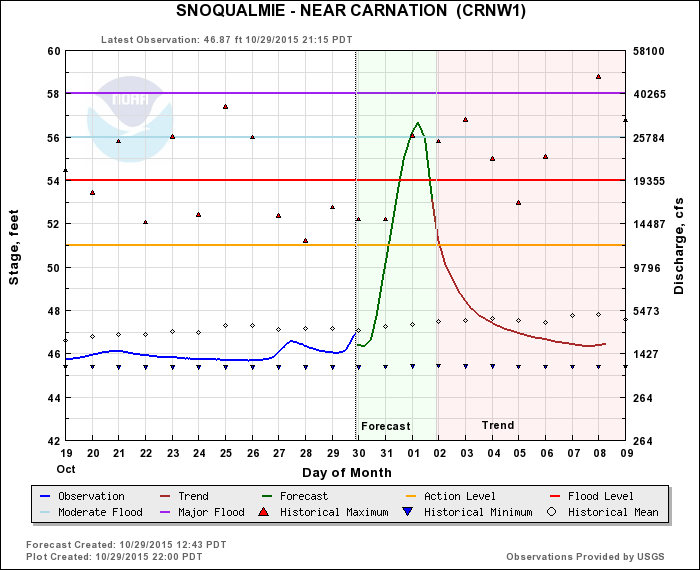 Rainier, to flood stage. The NW River Forecast Center is predicted a number of local rivers to hit flood stage, with some attaining a moderate flood. 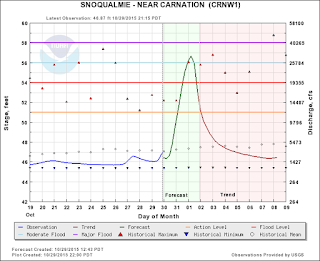 The hydrograph plot for the Snoqualmie River near Carnation shows the story with an extraordinary rapid rise predicted. The snow forecast for the period is on track, with the amounts being enhanced from the previous forecast cycle (see below). 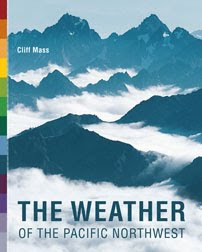 Need more weather fun?...no problem. Strong winds will be found along the coast, NW Washington, and on exposed mountain peaks. We had ½" last hour in the hills above Longview, 1.11" down before sunrise. Looks like the models are getting this one right! The comment on strong rain shadow is right on. At elevation here south of Sequim we got exactly 0.00" since midnight, and now the sun has broken through and blinding me as I try to write this in the sunroom. We need rain. Hopefully the rain shadow will break down during the weekend and give us a little bit of moisture. My trees are crying for it, and I refuse to irrigate this late in the season. I can't believe I managed to ride my motorcycle over 22 miles to work this morning and didn't get wet. I don't think I'll be that lucky on the commute home. I love these storms! I'm tempted to go sailing tomorrow, the wind forecast is fantastic! Amazing rain shadowing and sustained winds. What is the forecasted amount for Seattle proper during this storm? Certainly not 5+ inches, but about how much can the city expect? I was in Burlington for most of the day and it was surprisingly nice. Low 60s, filtered sun, but breezy. Off to the west were patches of blue sky In the lee of the Olympics. The drive home took me through the PCZ and for a few miles there was intense rain around 4PM and fully believe the inch an hour rate mentioned by NWS. The rain has really begun to come down. I have picked up 2/10th of an inch in 30 minutes, SSE of Boeing Field, starting around 11:45 PM. 1:15 am and East Bellevue's getting 0.25"/hr, which I believe... it woke me up. :-) I'm fine with it now, but a break from ~4-6 pm would be completely amazing! Make it happen, Cliff, and then it can rain 10" the rest of the weekend and nobody will care -- or we will even all be glad! I'm glad we're starting into the reservoir fill cycle, and maybe even the early-snow accumulation. By 5am Sat, the rain shadow over the east Strait has collapsed completely and its raining steadily in Sequim. I notice the shadow has reformed over central Seattle at this time. Got up early today to go fishing out of Port Angeles with my neighbor. Today is last day for salmon fishing until Blackmouth (local Chinook) season opens in December. But too much wind out on Strait. Damn near sank out there in the winds yesterday. Boat was in the middle of the Strait when this wall of whitecaps came from the west, out of no-where, and wind went went from nothing to 25 knots in moments. Wasn't supposed to do that until afternoon. Ran twelve miles back towards Port Angeles with waves breaking over the boat. Worried about swamping, but this was in a good boat. Very ugly. Worried about making it back. Soon after getting into PA harbor, and after getting screamed at by some guy on a tug because we were too close to that freaking oil drilling rig (which has returned from the Arctic) the winds jumped to 40+ knots. Unsurvivable by our boat if we'd still been out there. Whew! Yesterday came very close to being Salmon 1, Fisherman 0. And so the season ends. With wind and rain. Welcome to winter. Happy to see you as long as I'm not on that darn boat.